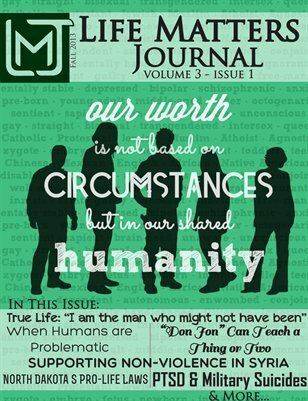 In this issue: True Life: "I am the man who might not have been", When Humans are Problematic, "Don Jon" Can Teach a Thing or Two, Supporting Non-Violence in Syria, North Dakota's Pro-Life Laws, PTSD & Military Suicide, and MUCH MORE! Promote discourse, share the discussion on human rights! It's important!